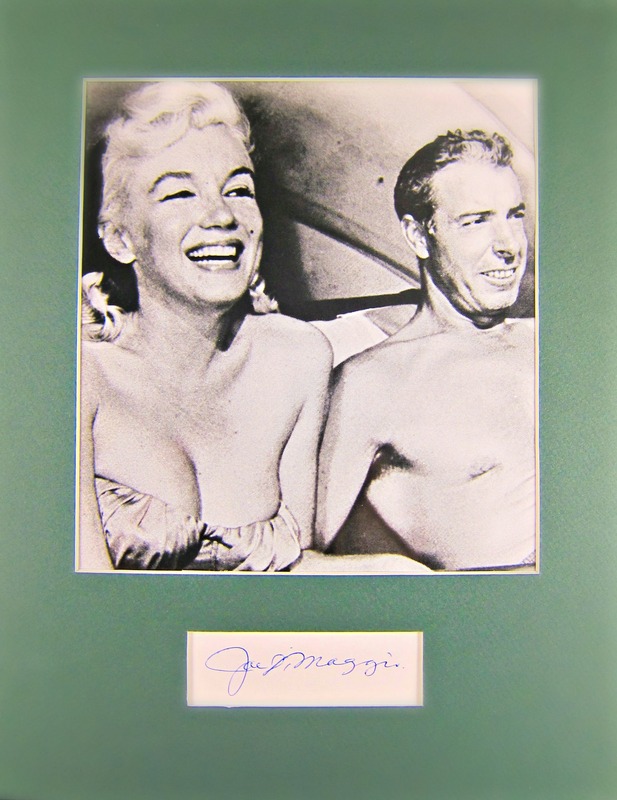 Joe DiMaggio cut signature matted with rare Honeymoon picture of Marilyn Monroe & Joe DiMaggio. Joseph Paul “Joe” DiMaggio (November 25, 1914 – March 8, 1999), nicknamed “Joltin’ Joe” and “The Yankee Clipper”, was an American Major League Baseball center fielder who played his entire 13-year career with the New York Yankees. He is perhaps best known for his 56-game hitting streak (May 15 – July 16, 1941), a record that still stands and many believe will never be broken. At the time of his retirement, he ranked fifth in career home runs (361) and sixth in career slugging percentage (.579). He was inducted into the Baseball Hall of Fame in 1955 and was voted the sport’s greatest living player in a poll taken during the baseball centennial year of 1969.